The farm is now closed for the 2018 season. 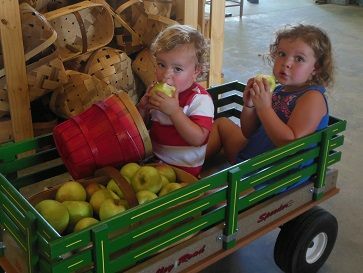 Plan a visit to Stepp Farm’s Hillcrest Orchard to pick your own North Carolina apples. Pick a 1/4 peck or bushels of fresh apples on our 4th generation orchard and farm. Call ahead to confirm your favorite apple variety is available for pickin’. Pick a pumpkin in the pumpkin patch! Bring your camera and capture a family memory! Enjoy the freshness of the outdoors! Walk your dog on a leash through acres of apple trees; please clean up after them. We ask that you please don’t bring your dog into the apple house due to food regulations.